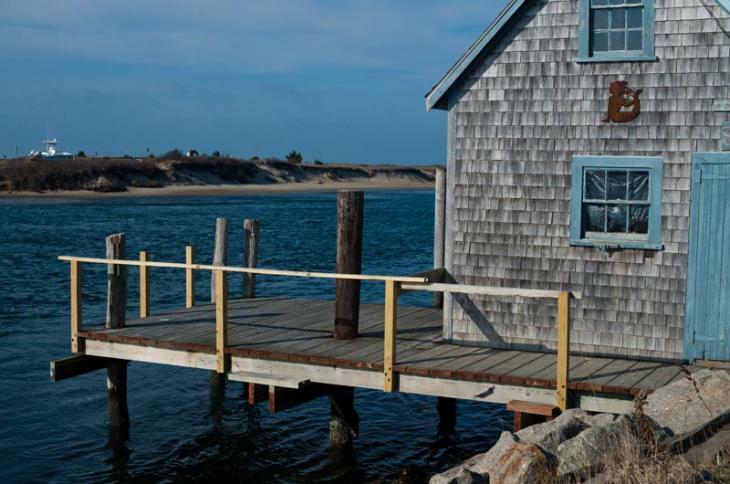 Oldest fishing shack in Menemsha is at center of long-running legal dispute over ownership. A longstanding heated legal dispute over a small fishing shack in Menemsha came to the fore at the Aquinnah selectmen’s meeting on Tuesday when the shack’s current occupant requested permission to fix rotting wooden spiles that extend off the lot’s dock. Vernon Welch showed the selectmen images of the spiles that he and his son took while scalloping approximately three weeks ago, revealing signs of advanced structural decay and rot. Selectmen granted Mr. Welch a lease for lot A, the former Vanderhoop fishing shack, five years ago after taking possession of the lot from its previous owner Camille Rose. At the time, selectmen said Ms. Rose was violating lease rules by sharing the shack with Wendy Swolinzky, who used the lot to conduct a boat rental business. Ms. Swolinzky, who was present at the meeting on Tuesday, filed a lawsuit in 2014 against the town, arguing that the town breached its contract with Ms. Rose when it rescinded a vote to allow Ms. Swolinzky to lease the lot that year. The litigation is still pending in superior court. But citing the dangers of rotted pilings in the harbor, selectmen countered that Mr. Welch could start the paperwork for the improvements without beginning the removal process. Selectman Gary Haley said a decision on the lawsuit is imminent. In other business, selectmen set a tax rate at $6.12 per $1,000 valuation for the 2019 financial year after hearing from assistant assessor Angela Cywinski. According to Ms. Cywinski, the tax rate went up by 64 cents from 2018’s $5.48 rate because of a 14 per cent increase and $325,000 override on the town’s budget. The town’s total taxable value was listed as roughly $745 million, about one per cent less than 2018’s taxable value of $749 million. Aquinnah selectmen also heard from residents Bill Lake and Noli Taylor about forming an energy and climate committee in the town. The pair have already been participating informally in the all-Island energy committee meetings but want to create a committee in Aquinnah to focus specifically on emergency preparedness and climate change activism. After selectmen authorized the creation of the committee, Ms. Taylor explained that one of their first orders of business would be to hold a community dinner at the Aquinnah town hall on Jan. 29, as well as work on an application for Aquinnah to become one of the 200 or so recognized green communities in Massachusetts. The southeast regional coordinator for Massachusetts green communities, Seth Pickering, described the five-step application process. Towns must adopt green zoning bylaws, an expedited permitting process for energy efficient projects, establish an energy use baseline, purchase fuel-efficient town vehicles and require new residential construction to minimize energy costs. Establishment as a green community qualifies the town for special green community grants that fund electrical and thermal energy conservation measures in the town. West Tisbury and Tisbury are currently green communities, and both received $140,000 designation grants in 2012. Part of that process, Ms. Taylor said, would be working with the Cape Light Compact, which offers grants and subsidies for energy-efficient appliances. “Hopefully this committee will help spread the word that Cape Light Compact can pay for those upgrades,” Ms. Taylor said. Selectmen also reappointed Kathy Newman as the town’s designated representative on the Martha’s Vineyard Commission. Mrs. Newman has served on the commission since 2000.